Intel recently unveiled its KabyLake-X and SkyLake-X processors as part of its Core-X series and took everyone by surprise by the huge amount of core counts that were included in the lineup. With options ranging from 4 Cores / 8 Threads to 18 Cores / 36 Threads, this is the first time that Intel has departed so heavily from the conservative yearly core count increases on the HEDT side of things – and most spectators agree that you can thank AMD for this one. Here is the thing though, Intel’s Core-X series will be rolling out in a staggered launch fashion – one which suggests that all parts including and above the 12-Core (Core i9-7920X) variant were thrown into the announcement at the last second in order to compete with AMD’s marketing material. To be fair, both AMD and Intel have the high core count parts announced just on a paper basis right now, but this is something that can be considered a deviation from Intel’s usual confident scheduling. Intel’s Core-X documentation states clearly that only the 10-core part is ready to ship at the moment. Intel’s public documentation about the Core-X series confirms this. Firstly, the Core-X specifications document clearly states that only the Core i9-7900X (10-Core) and below are available right now with the Core i9-7920X and above coming ‘soon’. Secondly, Intel’s official ARK portal only lists processors up to the Core i9-7900X in the Core-X series. This has troubling implications because it means Intel did not even have enough configuration details to do a paper launch. This is something that is confirmed by the fact that all but the most broad specifications of the Core i9-7920X and above are TBD. Intel’s official ARK portal does not list any Core-X processor above the i9-7900X. So just what is going on? Intel has apparently announced 12 core to 18 core parts that don’t even have finalized specifications right now. This isn’t their usual style and is in stark contrast with their CEO’s confidence that they could tackle AMD’s Zen based platforms. In fact, there is every reason to believe that Core-X processors above the 10 Core mark were thrown in as a last minute decision to counter AMD’s ThreadRipper announcement last month. So if you are to look at only the processors that Intel actually announced a week ago, it would be only the Core i7-7640X, Core i7-7740X, Core i7-7800X, Core i7-7820X and the Core i9 7900X. I cant emphasize enough how stringent the segregation between the two portions of the Core-X lineup is. 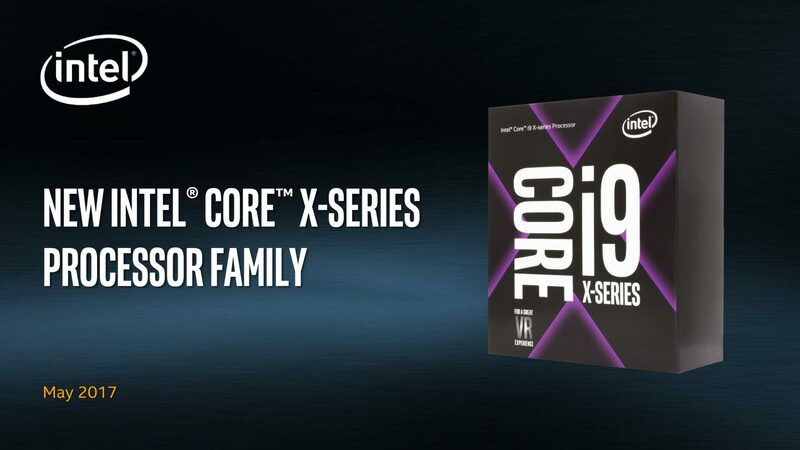 If you look at the foot notes of the Core-X documentation you will find that they only have testing details available for the Core i9-7900X and the engineering samples and review samples that are currently floating out there from the Core-X series are, you guessed it, all 10-core variants. The implications for this are clear, Intel appears to have been caught completely off-guard by AMD’s Zen powered comeback and at the very least assumed that high core count parts (such as ThreadRipper) would not be offered to the commercial spectrum. So the question now becomes? How quickly can Intel mobilize these new variants? Well, the good thing is Intel already has the dies ready thanks to its Xeon efforts but re-configuring them for the LGA 2066 socket will take time. Specifications will have to be finalized and clock speeds will have to be locked in and the thermal envelope streamlined. This is something that leads me to believe that AMD could very well beat Intel to channel for the highest amount of core count offered by a commercial processor. It will quite literally be the Core i9-7900X (10-Cores) vs AMD’s 16-Core ThreadRipper (allegedly the ThreadRipper 1998X ). Intel promised the Core i9-7900X and below by Q2 2017 so we should see them get retail availability by the end of June. However, there is no word for when we might get our hands on the high core count variants (Core i9-7920X through Core i9-7980XE), it might be a few more weeks or it might be a year as some rumors indicate; although a release sometime in 2H 2017 seems more likely to me. All that said, even if the head-start AMD gets is just of a few weeks, this is a valueable opportunity for team red to capitalize on the temporary respite in competition (for what seems to be the first time in years) in the high core count segment and establish momentum for its ThreadRipper products – assuming it can beat Intel’s High Core Count parts to channel and not end up in another Vega-like fix with ThreadRipper.